Celia first became interested in marathons in 1980, competing in the London marathon in 1981. Her interest in the Sahara marathon stemmed from an article in the Financial Times and the fact that a British woman had never competed in this. Celia changed that and entered. She described her training, including running on the spot in a sauna to get used to the humidity and to learn to take in more water. Finally in March 1996 she was in Casablanca preparing for the ordeal – the Sahara marathon is actually an endurance race. Competitors run specified distances on six successive days, starting with fifteen miles on day one with a maximum of fifty miles and a total over the six days of 150 miles. They carry all their needs (including food) on their backs, apart from tents (which were very basic indeed) and water. There are regular checkpoints with random checks of weights and kit. Water ration was nine litres a day for all purposes -drinking and washing – so conditions were indeed primitive. Sections had time limits – e.g. thirty-two hours and even one minute over time incurred disqualification. On day five Celia had an accident involving a fall with her backpack; following this she hallucinated very badly and says that she nearly died following the fall on a rock face. Eventually she reached the finishing line. She was the first British woman to complete the marathon and came 33rd of 200 entrants. There was a mud house at the final stage complete with a hot well. She and the others sat in the hot water, laughing and washing off six days of Sahara sand. This was an incredible experience and an incredible talk – presented without script or even notes and with great humour & feeling, ending by showing us the clothes in which she ran and. with great pride, her Sahara marathon medal. Chipping Campden is peculiarly susceptible to flooding when prolonged heavy rain or sudden thaws occur in an already sodden catchment area. To a large extent this is due to the size and peculiar character of the catchment area, most of which drains into the river upstream of the Care Home and Guild site and Sheep Street It is also due to the confinement of The Cam’s channel and choke points through the town. The visiting speaker for November was Mrs Anne Chambers from nearby Kiftsgate Court. The village hall was packed with members and visitors eager to hear about the history of the property and its famous garden. The house itself was built in the late C19th by the then owners of Mickleton Manor. They transported whole chunks of the manor house, which they loved, up to Kiftsgate by means of a light railway. Heather Muir, Anne’s grandmother, bought the property in 1918. 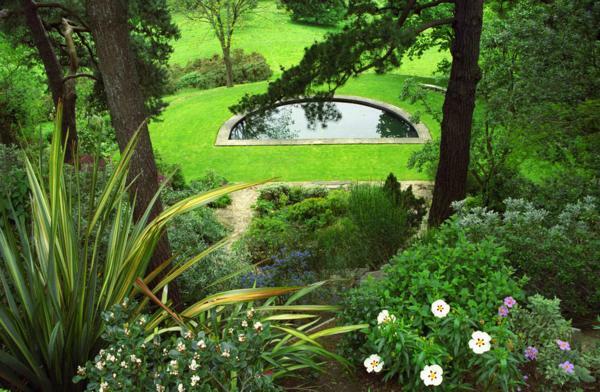 She knew little about gardening at that time, but with the encouragement of her friends, including Vita Sackville-West and Major Lawrence Johnston, from nearby Hidcote, she soon set about creating her garden. Anne Chambers is the third generation of gardening owners in her family, following on from her grandmother and her mother, Mrs Binny. She has no formal training in gardening but has picked things up as she has gone along. She is a hands-on gardener, being ably helped by her husband, Johnny, and two gardeners. Her slides took us round the garden through the seasons. She was able to point out original plants which had been introduced by her grandmother and described changes which had taken place over the years. The famous Kiftsgate rambling rose was the result of an order being placed for Rosa filipes which turned out to be something rather different from the plant ordered. It will grow up to 15 feet a year, and fills the surrounding trees with its clusters of white flowers in summer. Not a plant for a small courtyard garden! The garden continues to develop. Moving into the 21st century, the old tennis court has been turned into a most modern water garden with tall, eye catching metallic leaves that glisten with water from the fountains, reflecting in the pool below. Following her talk, Mrs Chambers answered members’ questions. She was thanked by Joanna Spark for a most fascinating evening. Those of us who have not been to Kiftsgate will now have to contain ourselves until the Spring, when the garden reopens for 2008. Bill Bond-Williams was the lucky winner of the raffle, a season ticket to Kiftsgate Court Garden kindly donated by Anne Chambers. The November meeting of Chipping Campden WI always includes the AGM so we usually whiz through the ordinary monthly meeting, minutes, reports and so on, to get to the AGM as quickly as possible Afterwards we normally have a short talk before refreshments. This year was different. We did it the other way round! The charming speaker had brought a presentation from the Gloucestershire Animal Welfare Association and Cheltenham Animal Shelter. Miss Jenner told us of the surprisingly wide field of activities that come under that organisation. As one would expect much of their work is in rescuing and, when the owners cannot be found, rehoming dogs and cats. Nine out of ten are strays but one in 10 is signed over from someone who cannot for good reason continue to keep their pet. After explaining the ramifications of this and other sides of their work. Miss Jenner, told us, with illustrations, of some of the tragic cases of neglect and abuse that have occurred. She hastened to assure us that none was local to our county, but the thought that anyone, anywhere, could have left a dog for six weeks locked in the house without food while they went on holiday or that boys could have attempted to hang a stolen puppy and then used it for target practice , was too horrific for words. Her own particular field is in education. Not just spreading news of the Shelter to WIs and other groups, but a project against violence, teaching disruptive schoolchildren and young offenders with a history of violence how to behave to other people and to animals. The intention is to increase compassion and respect for others together with getting them to become more responsible. We felt this aspect of her work was extremely valuable. The vote of thanks by Mrs Carole Moss expressed our appreciation both of her talk and of the work or the organisation. Then she left for it was a cold and frosty night and she had a long way to go. We turned to the more mundane matters of our ordinary and annual general meetings. At the AGM our President, Mrs Sue Morrey gave a report on her first year in office thanking her committee and others who had helped during the year – and later on the agenda she was voted back unanimously for next year. Awards were presented for those first second and third in the two monthly competitions held throughout the year. Thanks to the officers and to the committee as a whole in the past year were again unanimously and warmly given. Next came the refreshments, which were lavish and, of course, scrumptious. Stratford-upon-Avon choral society’s Autumn concert is the magnificent Missa Solemnis by Beethoven on Saturday November 17th 2007 in Holy Trinity Church, Old Town, Stratford at 7.30pm. Beethoven (1770-1827) was not a man of the church and he wrote very little music to religious texts. The Mass in D, or Missa Solemnis. was begun in 1819 (by which time he was very deaf’ and was intended for the enthronement of Beethoven’s patron the Archduke Rudolph as archbishop, in the next year. In fact it was not completed until 1823 and Beethoven seems to have worked on it with no specific event in mind. Moreover he had little apparent regard for the practicalities of performances, as the work is of a scale, both in length and in the required number of performers, that would rarely be available or appropriate to a liturgical performance of masses. For the first (incomplete) performance in Vienna in a theatre, quite different German words were used. Apart from such considerations, the work itself makes considerable demands on all the singers. The original director made protest to Beethoven on behalf of his sopranos and now I understand why! This suggests that, even more than usual, Beethoven was writing for himself, or rather to express his own rather unconventional religious feelings. He wrote on the score ‘From the heart’ … considering it one of his best works. It is an impressive composition with rapidly changing emotions, different phrases and longer passages shaped to the meaning or the text. Music director Stephen Dodsworth will conduct the Stratford Choral Society and the Regency Sinfonia with professional soloists: soprano Lisa Wilson, alto Alexandra Gibson, tenor David Brown and bass James Holiday. The choral society was first formed in 1836 and shares with the Huddersfield Choral Society the accolade of being one of the oldest choral societies in the country. For Missa Solemnis concert tickets £12 (adults) or £6 (students) or further information, phone Carol Jackson on 01386 841440. Tickets also available at Civic Hall Box Office, Holy Trinity Bookstall and Stratford Music Shop, Rother St. Up to two children under 16 are admitted free when accompanied by an adult. The Campden and district Music Society concert on Tuesday 13th November 2007 will feature Thomas Barber, oboe and James Southall, piano. Bristol born Thomas Barber, now only 25, gained a first class degree in medicine at Cambridge University, before studying the oboe at the Royal Academy of Music, graduating with distinction. He has been principal oboe with the National Youth Orchestra of Britain and the European Union Youth Orchestra, as well as oboist of the London Philharmonic Orchestra’s ‘Future Firsts’ apprenticeship scheme for 2005-6. As a recitalist and chamber musician, Thomas has performed at many music festivals, including Cheltenham, Cambridge and Banff in Canada. The programme at Campden will include works by Poulenc, Rubbra, Bach and Schumann. The Campden and district music society concert is honoured to be part of a special scheme, sponsored by the Countess of Munster Musical Trust, which each year selects and supports a small group of exciting new young artists. This concert takes place in Chipping Carnpden School Hall, Cider Mill Lane, Chipping Campden at 8pm on Tuesday 13th November 2007. With an annual membership subscription of £40, members have free access to the season’s five concerts and may introduce a guest. Members also have opportunities to join group visits to ballet, operas and concerts at different venues. New members (£40 for five concerts, i.e. ONLY £8 PER CONCERT) are warmly welcomed. To ensure that you receive full details of membership and visits, contact Campden Music Society, c/o Treasurer, Saxfeld, Hoo Lane, Chipping Campden, GL55 6AZ or phone 01386 841520. The Society thanks its commercial sponsors: Cutts of Campden, Cotswold House Hotel, Martin Gotrel, Andrew Greenwood and Mark Annett estate agents, Robert Welch and Graphic Print Partnership. The Spirit of Christmas fund raising evening will run from 4pm till 8pm on Tuesday 4th December encouraging people to raise funds for charity while enjoying the traditional spirit of Christmas with festive stalls, Father Christmas, carol singers and a nativity tableau to name but a few of the event’s attractions. Our fundraising events will include the Rotary Club tree of light, an indulgence tree, pony and trap rides, a prize draw and cracker trails. The event will open with Father Christmas traveling from the Guild in Sheep Street at 4pm and there will be entertainment throughout the evening, the length and breadth of the High Street including our own Morris Dancers, a living nativity tableau, carol singing, North Cotswold Community Radio, drumming by Year 6 from St. Catharine’s School Come and enjoy mulled wine, a pig roast, hot dogs and stalls selling seasonal produce including wreaths, lavender gifts, old fashioned toys, and much, much more. Enjoy a pony and trap ride from the Guild to Court Barn (or Court Barn to the Guild) then take part in the children’s or adults’ cracker trail, visit Father Christmas, win an amazing prize from the indulgence tree or enjoy Playbox’s seasonal production. Don’t miss Nell Gifford and her husband Tito, both of Gifford’s Circus, who have kindly agreed to attend the evening and to help us with the switching on of the lights. Programmes with a full listing of events and locations will be on sale from mid-November and every £1 paid for a programme will go directly to the Luke Jeffrey Memorial Trust (Regd. Charity No. 1120375). The programme contains a form for free entry into a prize draw (be sure to fill this in) and a form for the Rotary Club’s tree of light. Proceeds from the Spirit of Christmas fundraising activities this year will be going to the Luke Jeffrey Memorial Trust. The Luke Jeffrey Memorial Trust is a local charity set up in memory of Luke Jeffrey – a fifteen year old swimmer and an Olympic hopeful who tragically lost his life in a swimming accident last year. The fledgling Trust’s first project is to initiate a UK awareness campaign in water safety through production of a national curriculum linked DVD to be circulated to every primary school in the UK. At a regional level, the charity is providing bursaries and scholarships to help children make the leap to competitive swimming and is sponsoring and promoting a mentoring scheme for young swimmers. The charity’s initial target is to raise £20,000. Let’s help them do it! This is a great opportunity to complete all your Christmas shopping in a single trip, as the vast majority of shops in town will be staying open until 8pm, while raising funds for a very worthwhile cause. We look forward to seeing you on 4th December! The Mickleton Society was due to visit Kelmscott Manor on 6th September but the trip had to be cancelled because of the recent flooding problems. At short notice, a visit to Berkeley Castle was arranged for the same date and 34 people set off that morning. The weather was excellent and the visit to the Castle was enjoyed by all. Our ticket also included a visit to the Edward Jenner museum and this, too, was greatly enjoyed. Edward Jenner lived in a beautiful house next door to the Castle. He was, amongst several other accomplishments, a country doctor but is famous for inventing smallpox vaccination – the leaflet says that this discovery was responsible for saving more lives than the work of any other man. There are some quite fascinating relics and photographs in the museum. A very good day was had by all and special thanks are due to Janet Walmsley for arranging this trip at such very short notice. Our winter 2007 program commences on Tuesday October 2nd in King George’s hall at 7.30pm with a talk entitled “Bess of Hardwick”, followed on Tuesday 6th November with “Sahara Marathon”; the final 2007 event being our annual Christmas supper on Friday December 7th. Christmas supper tickets are now on sale and going rapidly! Marguerite Bell will be catering for us again, to her usual high standard and this year there will be entertainment by a member of the Magic Circle. Tickets will be on sale at both the October and November meetings, with the price held at £13. Alternatively they can be obtained from Sandra Barlow (contact us for details), who be pleased to seat you with your friends, if you let her know by November 14th. I am sure you all know early booking is essential as this event is always a sell out. You are currently browsing the archives for the Noticeboard category. Entries (RSS) and Comments (RSS). 23 queries. 0.314 seconds.